The quality of expenditure of Telangana (defined as capital outlay and net lending as a proportion of total expenditure), according to ICRA, is superior to most of its peer States. 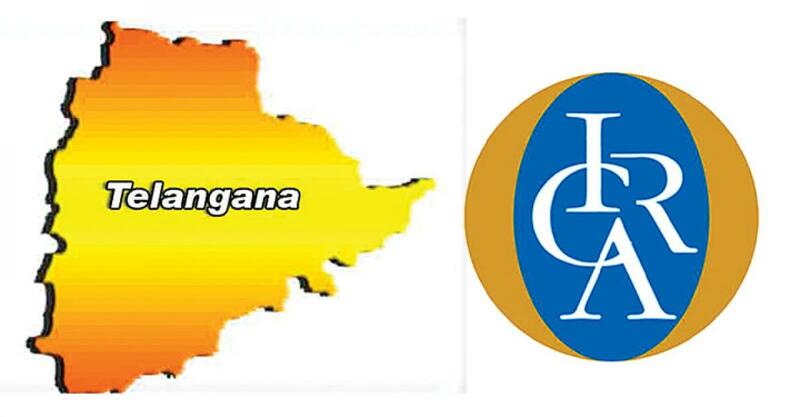 Telangana State has gained 'A' category status in the rating of India Credit Rating Agency (ICRA). This is in recognition of state’s revenue in terms of tax collection. This enables Telangana in getting priority in terms of availing loan from the national and international agencies, with lower interest rates as compared to the rates imposed on the States with lower rankings. Credit rating is an assessment of the credit worthiness of a borrower in general terms or with respect to a particular debt or financial obligation. Credit assessment and evaluation for governments is generally done by a credit rating agency like ICRA. ICRA, established in 1991, is an Indian independent and professional investment information and credit rating agency. It has assigned a Structured Obligation (SO) rating to the Rs 5,000 crore proposed long-term debt programme to be raised by various entities of the Government of Telangana. An SO rating is specific to the rated issue, its terms, and its structure. The rating assigned to the debt programme reflects the credit profile of State Government as well as the integrity of and expected adherence to the structured payment mechanism by the entity raising debt on the strength of the Government guarantee. The rating takes into account ICRA’s assessment of a robust potential of the State’s own tax revenues on the back of its expectation of higher consumption levels in the State, given the high per capita income of Rs 95,361 compared to the national average of Rs. 74,380 and a favourable industrial policy framed by State. ICRA estimates that the leverage levels (equivalent to Debt + Guarantees) of Telangana relative to its Gross State Domestic Product (GSDP) as well as Own Tax Revenues of the State are superior to a number of its peer States. On the other hand, ICRA also takes into account the spending commitments of the State like the farm loan waiver, enhanced allocation of subsidised food and pay hike to the State government employees, which may exert pressure on the State’s fiscal balances in the near term. While assigning the rating, ICRA has evaluated various socio - economic factors and fiscal results including, among others, the previous year’s revised estimates of and current year’s budget estimates of government. ICRA relied upon various scenario analyses to test the robustness of Telangana financial position. The State’s performance on various socio economic indicators is mixed. While Telangana has a superior rate of urbanization (38.7 per cent), the literacy rate (66.5 per cent) in the State is lower than the national average (74 per cent). The State’s revenue receipts in 2014-15 for a ten month period stood at 16.5 per cent of the GSDP, benefiting from a superior Own Tax Revenues of the State (SOTR) as a proportion of GSDP (8.2 per cent). Telangana revenue receipts are expected to increase by 9.7 per cent in 2015-16 led by a 31.4 per cent expansion in SOTR and 31.5 per cent increase in the share of central taxes. Notably, Telangana Government anticipates a contraction of 43 per cent in grants to Rs 12,823 crore in 2015-16 from Rs 21,721 crore in 2014-15 revised estimates. The share of Telangana in the inter se devolution of union taxes has been reduced to 2.437 per cent for the Fourteenth Finance Commission award period from 2.893 per cent over the Thirteenth Finance Commission’s award period. Nevertheless, the impact of the same is more than offset by the increase in the aggregate share of States in the Union taxes to 42 per cent from 32 per cent during the aforementioned award period. Consequently, Government of India has estimated that Central tax devolution to Telangana will increase by a robust 31.5 per cent to Rs 12,823 crore in 2015-16 from Rs 9,745 crore in 2014-15, which would augment the resources of the State. On the other hand, the sharp contraction in grants anticipated by Telangana in 2015-16 relative to 2014-15 is on account of a reduction in both non-plan and plan grants. ICRA mentioned that Government of Telangana has introduced various social and welfare schemes since June 2014, which are likely to impact its revenue expenditure. For example the crop loan waiver with an estimated outlay of around Rs 17,000 crore to be spent equally over four years. Further, the acceptance and the implementation of the recommendations of the Tenth Pay Revision Commission in the current fiscal year to provide a higher fitment benefit of 43 per cent for fixing the pay is also likely to exert pressure on the fiscal health. However, the State’s interest payments as a proportion of revenue receipts at eight per cent in 2014-15 and 10 per cent in 2015-16 are favourable compared to most of its peer States. Food and power subsidies together has enhanced the entitlement of subsidised food and enlarged its scope by relaxing the eligibility criteria for claiming subsidised food. This has resulted in state’s estimated food subsidy outlay to expand by almost three times the estimate to Rs 2,200 crore in current year. The power subsidy burden of Telangana is estimated to increase to Rs 4,257 crore this year equivalent to 5.5 per cent of the revenue receipts of the State. The quality of expenditure of Government of Telangana (defined as capital outlay and net lending as a proportion of total expenditure) according to ICRA is superior to most of its peer States. The State has accorded a priority to the irrigation sector, as it estimates to spend a considerable 44 per cent of the forecast capital outlay of Rs 15,983 crore on various irrigation projects in 2015-16. The bulk of the debt of the undivided State of Andhra Pradesh has been apportioned between the successor States of Andhra Pradesh and Telangana. Based on the same, ICRA estimated that the leverage levels (equivalent to debt + guarantees) of Telangana relative to its GSDP as well as SOTR) are superior to a number of its peer States.